Yaquina Head is a basalt peninsula that stretches a mile into the Pacific Ocean near Newport on the Central Oregon Coast. On the tip of the basalt headland stands the tallest lighthouse in Oregon. Below lies a black polished cobble beach and tidal pools teeming with sea creatures. Managed by the BLM, you can learn about the ecology and history of Yaquina Head at a massive interpretive center. Begin your visit by parking at the Quarry Cove Trailhead, and walking down the paved Quarry Cove Trail. The trail leads you to rocky cove filled with outcrops of volcanic basalt sprinkled in the green water. We scrambled up some of the rocks out into the water. The tide was going out, and tidal pools with colorful marine life were emerging. From the top of the rocks we could see a rock further out where a bunch of seals were sunning and barking. Quarry Cove Trail has not always looked like this though. It gets its name because from 1920 to 1980 it was a source of rock for building Highway 101. So much rock was removed for the construction of the road that the shape of the headland was dramatically changed. When the BLM took over management of the area they actually created the rocky inter-tidal zone, making it the first man made ecosystem of its kind. Quarry Cove is a good place to learn about human’s negative impact on their environment, but also to appreciate the possibilities of ecological restoration. At the end of the Quarry Cove Trail, you can scramble onto outcrops of rock that go out into the cove. Bring your binoculars, from the rocks at Quarry Cove you can see Seal Rock with lots of marine mammals. Continue walking west on the Quarry Cove Trail along the rim of the headland. 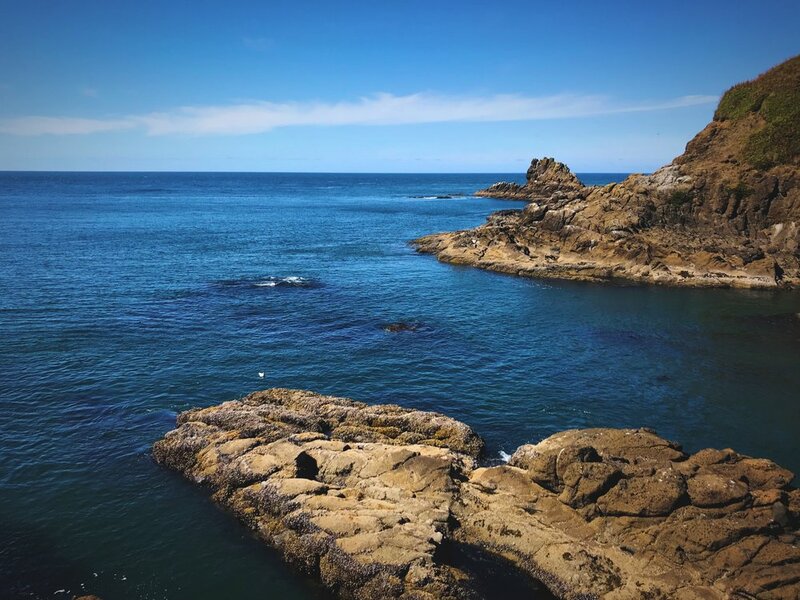 There aren’t many hiking trails at Yaquina Head, so walk between the sites if you want to do a bit of hiking during your visit. Yaquina Head has a massive interpretive center where you can learn about intertidal ecosystems, sea birds and marine mammals. Ocre sea stars are the real “star” of the show in the tidal pools. The purple urchins and the various types of kelp and algae create a great contrast against the black stones. The Yaquina Head Interpretive Center also extensive displays about the human history of the headland. You’ll find a full size lighthouse lantern replica and original logs and journals from lighthouse keepers. Watch a fascinating and kind of humorous video about the difficult and lonely life of the lighthouse keepers and their families. Going back further in time, check out the displays about the traditional lifeways of the native people of the region, who are today called the Siletz people. Walking on the cobble beach can be a little difficult. The entire beach is made of this polished basalt. Don’t take rocks with you. If a thousand visitor each took only one rock, the beach would disappear in a matter of years. From the Interpretive Center continue the walk along the top of the headland, and then descend a wood staircase to the Cobble Beach. At the bottom of the stairs, you’ll discover the most incredible beach covered in polished, shiny black stones. The stones are mostly about fist size and they are very round, which makes them very difficult to walk on. The wave action has broken down the black volcanic stone and rounded and polished the rocks to create this unique beach. When the water hits the cobble stones they make a noisy clattering sound. Ian checks out some of the tidal pools at Yaquina Head. Ian found a bunch of these tiny purple crabs under some of cobble stones. Further out the cobble stones turn into large slabs of basalt. We visited at low tide, and we were able to walk out on the rocks and explore the tiny ecosystems living in the inter-tidal pools around the rocks. (Check this chart for tide times when you are visiting.) You’ll see ochre sea stars, giant green anenomes, and purple urchins. You might spot sculpin swimming about in the tide pools, and on the rocks you can find mussels, limpets, and other mollusks. Ian found some tiny purple crabs living under some rocks. At the tip of Yaquina Head, you’ll find the tallest lighthouse on the Oregon Coast. The slender black and white lighthouse stands 93-feet above the headland. It took nearly 370,000 bricks to build the lighthouse. The light was first lit in 1873 after the Fresnel lens arrived all the way from Paris. The Yaquina Head Lighthouse is at the tip of the basalt headland that sticks out into the Pacific a mile. The view of Oregon’s tallest lighthouse from the cobble beach. The Yaquina Head light house has been in operation since the original lighthouse keeper climbed the 114 spiral steps and lit the oil lamp, and it is still actively run by the Coast Guard today. Throughout its history there have been many reports of the lighthouse being haunted, although the myth of a lighthouse keeper dying from falling down the steps has been debunked. The light was automated in 1966, but reports of strange occurrences at the light continue. Free tours of the lighthouse are offered as staffing allows, but a reservation must be made at the interpretive center.